I remember when I was much younger staying up til one in the morning watching ‘Harold Pinter’ night on BBC2 and being utterly captivated by the sections of his plays that they showed and by his performance in One for the Road that was shown as the finale. That night I went to sleep genuinely excited about theatre and plays and their possibilities. Sometime later i got a copy of (the radio play) ‘A Slight Ache’ on cassette and litened to it over and over again until the tape wore out. Later still I saw ‘Betrayl’ at the Theatre Royal in Bath and was blown away at the seemingly effortless skill and poignancy. Seeing it again more recently at theatre upstairs in Exeter I still got the same buzz from seeing it. A buzz and a feeling that none of my writing would ever come anywhere near that level. His amazing eye for the menace that lurks just beneath the surface of society and skill in bringing it deftly out of the darkness and into the lights of a stage and showing us a hint of it is as remarkable and fresh as it first was when he first appeared all those years ago. Undoubtably his work will survive long after his death and justifiably so. If I had to list people who have influence me and cemented my joy at the craft of theatre and playwriting he would be high, high on the list. Although I loathe the whole notion of meeting people you admire, it saddens me that I will not get to in this case because I think I owe him a huge debt in forming one of the main passions of my life. So, for what it’s worth, thank you Harold. Autumn Terror chills the Arts Centre! After some intense last minute voting… It was Jon Nash, with Autumn Terror, who finally came out the winner of our competition putting his dream a step closer to reality. Jon (centre top) & Swindon’s Old Town Theatre Co.
As the Playwrite winner, Jon’s play was taken up by Swindon’s Old Town Theatre Company for rehearsals followed by a performance at the Arts Centre in Swindon. What better prize for an aspiring writer? It was on Thursday 22nd February 2007, at the Swindon Arts Centre, that Autumn Terror made its debut in front of a paying audience as part of the Harold Jolliffe One Act Play Festival. Jon was there as well and was thrilled to see his creation brought to life and after the show he got to meet the cast and crew for Autumn Terror. So there you have it… another year of Playwrite done and dusted. We’re very much hoping to bring you another cracking season of drama in ’07/’08. So watch this space! Autumn Terror by Jon Nash is this year’s Playwrite Winner! 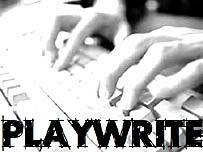 Playwrite! is the only competition on the radio that gives people the chance to write an original story of their own with the chance of having it performed on stage. Voting in this year’s competition closed at 12 noon on Thursday, 4th January and it carried on right up to the wire! Jon Nash’s ‘Autumn Terror’ came out top. SO, HOW DID THE VOTING GO? REMIND ME, WHAT WERE ALL THE PLAYS ABOUT AGAIN? In Victorian London, two prostitutes, Sarah and Anna, contemplate their safety at the height of the attacks by Jack the Ripper. Sarah is urged to leave by George, a trainee doctor but Sarah disappears after asking a charity for help and being rejected. We join the story as George, a trainee doctor, is encouraging the prostitute Sarah to leave London at the height of attacks by Jack the Ripper…..
Click below to listen to the extract in streaming Real Audio. Alan and Eve are obsessed by their son’s talents at tennis. In fact, they put him ahead of their other two teenage children. A telling insight into how parents can drive their children to success for their own reasons…. The story of Alan and Eve Henderson and their long suffering – non tennis playing youngsters, Jack and Freya. We join the plot as parents Alan and Eve pin their hopes on their son’s success of playing centre court at Wimbledon if he wins a young tennis talent tournament…. What happens to Autumn Terror now? The winning play will be performed by the Old Town Theatre Company as an entry in the Harold Jolliffe One Act Play Festival in February at the Swindon Arts Centre. For any author, it’s a fantastic prize. The performance date is yet to be decided but will definitely be on either, Thursday 22nd, Friday 23rd, or Saturday 24th of February 2007. For more details, check the Festival website. When it’s known, the performance date will be given there. It’s at http://www.swindonweb.com/haroldjolliffe. This is an hour long programme guiding you through who the finalists are, extracts from their plays; the judges’ comments, and discussion with the entrants too. Click below to listen to the Playwrite! The Masterclass programme.